Stressed Out about Employers Running Background Checks on You? This conversation made me reflect on other conversations with applicants over the years. Some of the misconceptions that tend to float around about background checks and how they are used. It seems that applicants are putting themselves through a lot of unnecessary worry over the background screening process. So, for the guy in the elevator and all the other stressed out candidates, this blog post is for you! Misconception #1 – Employers are looking for reasons not to hire me. Truth: Background checks are an investment that employers choose to make on the candidates they are interested in hiring. 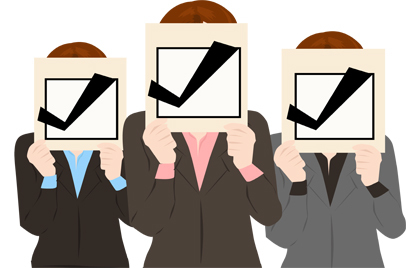 If an employer has made the decision to run a background check on you, it is a very good indicator! They are seriously considering extending a job offer to you. Unfortunately, according to studies, nearly half of all resumes contain a major fabrication. And, one out every six crimes occur in the workplace. Employers rely on background checks to validate your credentials, protect their brand, and ensure a safer workplace. But, can you blame them? Misconception #2 – If I have a criminal record, I can’t get a job. Truth: The U.S. Equal Employment Opportunity Commission (EEOC) has passed guidelines that prohibit employers from disqualifying an applicant purely because he/she has a criminal record. Employers may only hold your record against you if that record directly relates to the job you are applying for. For instance, having a DUI may not disqualify you from an office job. But, it would be a huge problem if you are applying to drive a school bus. The truth is that there are many factors that companies take into account when an applicant has a criminal history. For example, internal company policies, the seriousness of the offense, how long ago the offense occurred, etc. Misconception #3 – It can hurt my credit if a background check company does an employment credit search. Truth: An employment credit check is not the same as a credit check a lender might run and will NOT negatively affect your credit score. Employers will often run credit checks on employees whose job descriptions require managing that organization’s money or financially advising their clients. A company may feel that if you are not able to manage your own finances, they don’t want to give you the opportunity to handle theirs. A credit check can also provide an employer with information that corroborates your identity, age, employer, and residence. Additionally, a credit report compares your name to the Office of Foreign Asset Control list of Specially Designated Nationals. Misconception #4 – Background checks put my private information at risk. Misconception #5 – If I was a temp, I should list the company where I worked at, rather than the agency I worked for. Truth: Applicants who have worked as temps have a tendency to write down the organization where they worked rather than the temp agency that they worked for when listing past employers on their application or resume. After all, you want the hiring manager to understand you have experience in a given field. Unfortunately, this can lead to confusion when a background screening agency attempts to confirm that past employment. The HR Department of the company where you temped at will not have a record of your employment. It also may not be able to confirm your information. If you do not include the fact that you worked as a temp, you may not get credit for your past experience. Or worse, it may appear that you have misrepresented yourself. Misconception #6 – I have to lie to cover up the problems in my past or I won’t get the job. Truth: Honesty really is the best policy. If there are problems in your past, it can be very tempting to “forget” to list a county where you have a criminal record, or not mention a record that you “think” was expunged. This can be a risky strategy. Many employers run Address Verification Searches that match an individual’s social security number to any names or addresses associated with that number. This helps direct employers as to where criminal record searches should be ordered and what names should be searched. If negative information exists in your past, it is much better to be forthright and have the opportunity to explain the situation from your point of view rather than appear as dishonest. If you can admit your mistakes and provide your hiring manager with concrete examples of how you have worked to improve yourself, you stand a good chance of still landing the job. Misconception #7 – Every background search is the same, so every application, hiring process, and background check will be the same. Truth: Employers vary greatly in their needs and their background screening policy will certainly reflect that. There are a wide variety of background check options available to employers. Background checks can be as simple or comprehensive as an employer desires. The information contained in a background check can vary based on the particular searches an organization chooses to order. Misconception #8 – As an applicant, there is nothing I can do to speed up the process. Truth: As an applicant, there are ways you can help speed up the background check process. Double check the information on your application. Make sure that your application is detailed and accurate. Contact your references so they are aware and they prepare for the fact that someone may be contacting them in the near future. If your future employer chooses, you may also be asked to submit your information by means of an online process, such as Justifacts’ Applicant Portal system. The Applicant Portal method will help you to quickly secure all the information needed to process your background check. If using this method, your future employer will email you a request. You will need to complete the necessary information within 72 hours. If the worst happens and you are denied employment because of information uncovered, you should be aware that you have certain rights. First, you will receive a pre-adverse action letter that will explain that you may not be hired due to something discovered in your background check. You should also receive a copy of your background check so that you can review it and look for any erroneous information. At this point, you will have an opportunity to dispute the results of the background check. You can also ask for any erroneous information to be reinvestigated. In addition, if you have any other questions or concerns, toll-free numbers will be provided and a representative can assist you. After all the information has been brought to light, if the decision has been made not to extend a job offer, you will receive a final Adverse Action letter and an updated copy of your background check. Hopefully, having access to this information can help prepare and guide you as you continue your job search.